Boil shells for 9 minutes. Remove from water and rinse. In a large bowl combine the following: 4 cups of ricotta cheese, 1/2 of mozzerella, 1/2 cup parmesan, 1 1/2 teaspoon of basil and 1 cup of spinach. Stuff this mixture carefully in to each shell, do not over fill. 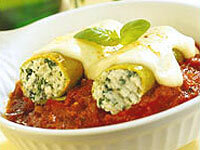 Place in a single layer and cover with a marinara sauce and cover and bake in a 175*C oven for 30 minutes. Remove and sprinke with mozzerella cheese let stand for 5 minutes.